SpaceX is launching arguably its most daring mission to date Tuesday, when the Falcon Heavy rocket takes off on its first test flight. Add SpaceX as an interest to stay up to date on the latest SpaceX news, video, and analysis from ABC News. 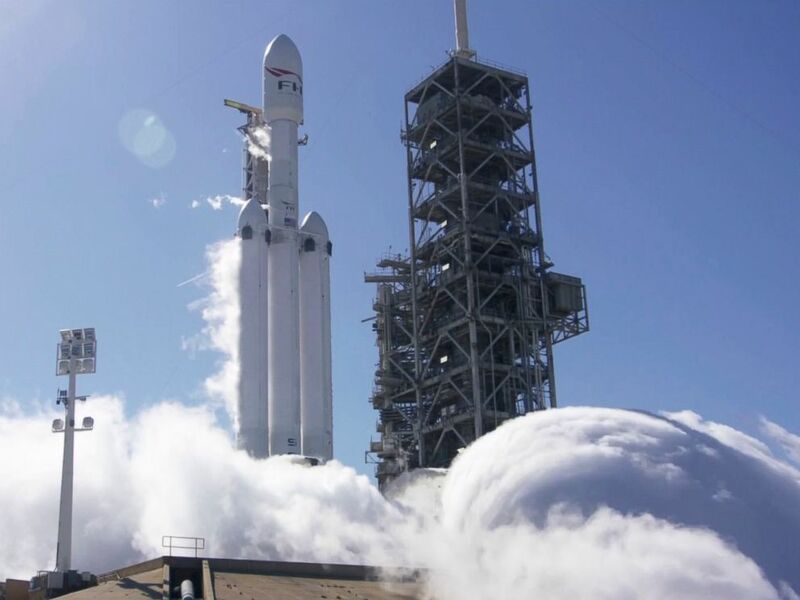 The Falcon Heavy rocket is massive, larger than anything that has launched since NASA's Saturn V missions, which took people to the moon. The rocket's target launch is set for Tuesday at 1:30 p.m. ET from Cape Canaveral, Florida, with a 2.5-hour launch window. There are windows scheduled on Wednesday and Thursday as well, in case Tuesday's launch doesn't work. Thousands of excited viewers are already lining up along the Florida coast to witness the event. Even actor Harrison Ford will be in attendance -- the Falcon, after all, is named after his Millennium Falcon from "Star Wars." In this image from video made available by SpaceX, a Falcon Heavy rocket is test fired at Cape Canaveral, Fla., Jan. 24, 2018. 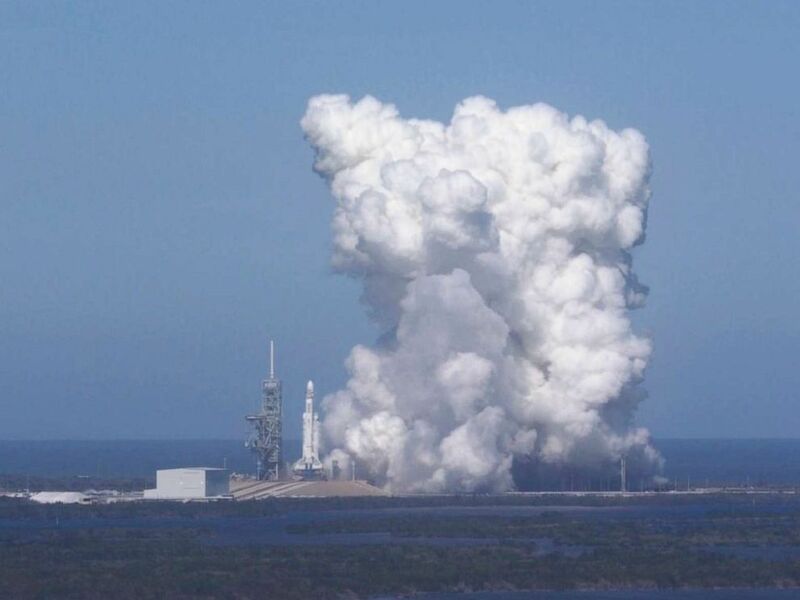 This is a private mission funded by billionaire Elon Musk, CEO of SpaceX -- the Falcon Heavy has three engine cores with 27 Merlin engines, capable of lifting 5 million pounds into orbit. But this mission is carrying a much lighter cargo. Musk, 46, will send his own cherry-red Tesla roadster, complete with a spacesuit-clad dummy in the driver's seat, as its cargo. The car "will be in deep space for a billion years or so if it doesn’t blow up on ascent," Musk tweeted in December. "Red car for a red planet," Musk, who runs the electric car company in addition to SpaceX, added. Musk said today the launch is one big gamble, but oddly enough, he's not feeling any pre-launch jitters. "I’m excited and giddy," he said Monday. But he is worried the car won’t survive low Earth orbit -- just getting through the Van Allen radiation belt will be a challenge -- but if it succeeds, after that, the rocket will get into a trajectory for Mars, he said. The launch is a critical step in Musk’s plan to send two private passengers into orbit around the moon -- this is the rocket and capsule that will be needed to do so. Musk's ultimate goal, he revealed in September 2016, is to colonize Mars -- a feat he hopes to achieve by drastically reducing the cost of spaceflight. That's where reusable rockets come in. The Falcon Heavy's boosters will detach after launch, eventually coming to rest on land or a drone ship for reuse on a future flight. In this Jan. 24, 2018 image from video made available by SpaceX, a Falcon Heavy rocket is test fired at Cape Canaveral, Fla.
SpaceX will attempt to land all three boosters, two on land and one on sea, another first for the company. Setting up shop on the Red Plant is "a fairly significant technical challenge," Musk admitted -- it is rocket science, after all -- but "I think it would be the most inspiring thing that I could possibly imagine." SpaceX and Boeing are also racing to test their Dragon and Starliner human-rated capsules this year. If they succeed, NASA can reduce its dependence on the Soyuz spacecraft to take astronauts back and forth from the International Space Station.